#ISAutowk: World-class technical content at Nashville automation event! ISA’s Automation Week: Technology and Solutions Event 2013 wrapped up on Thursday (7/11/2013), in the well known Music City, Nashville in the USA. Three days of comprehensive technical sessions, keynote addresses, networking events, standards meetings, and training courses were availed of by hundreds of automation professionals. Releases received at Read-out from ISA and others about the event! 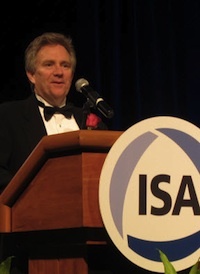 The ISA Automation Week program also included 24 technical sessions, organized into six educational tracks. These tracks, which included Industrial Network Security; Creating Business Value through Automation; The Connected Enterprise; Wireless Applications; Industrial Automation and Control; and Asset Lifecycle Management and Optimization/Strategy, were organised with a focus on the critical components of successful automation – safety, people, business and technology. This was the first time we have actually been unable to travel to the event and so we had to rely on the tweets of those who were happy to share information. The number of tweeters was surprisingly small though some were very good a keeping us informed especially Control Global’s Walt Boyes and Joel Don who was tweeting under the ISA Interchange identity. There were one or two sharings commenting on the paradox of an excellent high class programme and the fact that the number of delegates was small. “The program is terrific. The audience is small,” said one, and another “I don’t know what we have to do to build it up again.” It has always been a bit of a mystery to me how the incredibly valuable and unaligned resource treasure of ISA does not appear to attract American professionals in the way it seems to internationally. The event was preceded by some governance meetings of the ISA itself which had delegates from throught the world discussing and voting on important changes in how the Societ is governed. The delegates were also treated to a pre-view of a new ISA website which is the result of mammoth work behind the scenes. This will make the virtual leviathan of information already on the ISA site more easily accessible to members and other visitor. The beta-version should be on line in matter of weeks. Watch out for it! Eric Byres accepts his award! Another stalwart of Automation Week is the eve event of the ISA Honours & Awards Banquet where Automation Professionals are honoured by their peers. These included Eric Byres, of Tofino, one of the pioneers in expertise and leadership in the quest for cybersecurity solutions to protect industrial control systems. Wednesday morning’s keynote address was delivered by an American General, Robert E. Wheeler, Deputy Chief Information Officer of the United States Department of Defense. He is responsible for Command, Control, Communications and Computers (C4) and Information Infrastructure Capabilities (DCIO for C4IIC) and serves on the executive staff of the US Secretary of Defense. This address focused on the importance of industrial infrastructure cybersecurity and the threats posed daily to our nation’s critical infrastructure networks. Wheeler went on to discuss the protection of America’s SCADA systems, power grid, and other key infrastructure assets. “Information assurance must be baked in from the very beginning of your work as engineers and automation professionals – you can’t just bolt it on,” he said and this was reported by our tweeters. The Automation Federation and ISA cybersecurity experts have been invited by the White House and NIST to participate in developing the framework for the President Barack Obama’s executive order PPD-21 calling for the cybersecurity of industrial automation and control systems and critical infrastructure. 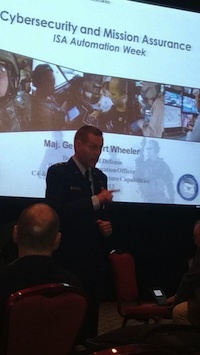 When asked about the importance of training and recruiting future cybersecurity professionals, Wheeler stressed the importance of STEM education initiatives combined with mentoring programs that can ignite the curiosity and intellect of future engineers, inspiring them to become the next cyber warriors in the fight to keep American companies and infrastructure safe and secure. As the event drew to an end this somewhat plaintive tweet, “Need titles for the flight home? 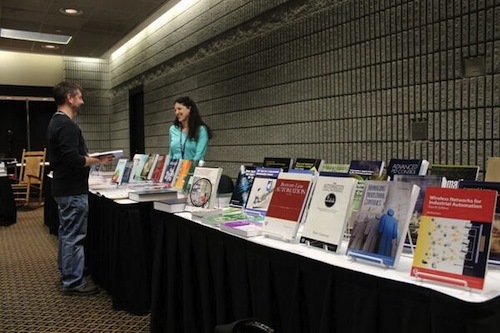 Check out the #ISAutoWk bookstore, across from the Networking Hub.” This is of course the indefatigable Publications Department which issues a regular supply of books, the Society Magazine, the incomparable ISA Transactions, the Journal of Automations and innumerable papers since the formation of the Society almost 70 years ago. The proceedings for this years are now available free to members for download! Additional ISA partners participating at ISA Automation Week included ISA’s Premier Strategic Partner for Systems Integration, MAVERICK Technologies; ISA’s Corporate Partners, Honeywell and OSIsoft; and ISA’s Automation Week Partners, aeSolutions, ARC Advisory Group, Eaton, ExperTune, and Falcon Electric. This entry was posted on Monday, November 11th, 2013 at 2:32 pm and is filed under Associations, Automation, Instrumentation, Publications, Training/Education. You can follow any responses to this entry through the RSS 2.0 feed. You can leave a response, or trackback from your own site.